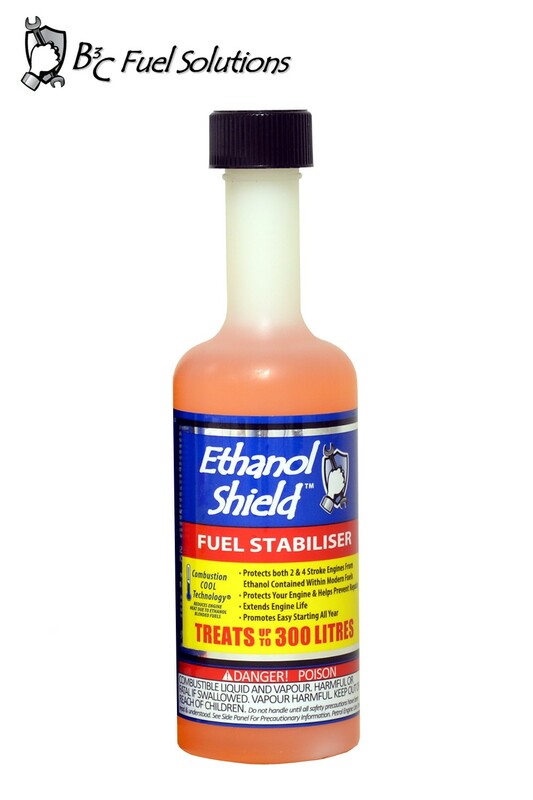 PREVENT future engine problems with Ethanol Shield. This year round fuel stabiliser is suitable for power equipment with either 2 or 4-Stroke engines. The preventative maintenance formula eliminates then prevents ethanol related problems. Ethanol Shield is part of the multi award winning family of fuel solution products from B3C. This product range is scientifically engineered to provide a quick, easy, and effective means to TEST - FIX - PREVENT the problems associated with modern day fuels. Application: Prevent future engine problems with Ethanol Shield. This year round fuel stabiliser is suitable for power equipment with either 2 or 4-Stroke engines. The preventative maintenance formula eliminates then prevents ethanol related problems. Preventative Maintenance Formula: Acts as a fuel preservative by adding antioxidants into the fuel because ethanol blended fuel, (such as E10), is rich in oxygen and acts as a fuel catalyst by keeping the hydrocarbon chains short, preventing the fuel from decomposing prematurely. Removes Water: Envelopes water molecules, preventing bonding with ethanol. By enveloping the water, it now passes harmlessly through the fuel system, including all filters and screens, to be vapourized in the combustion chamber. Prevents Ethanol Phase Separation: Water removal prevents phase separation which leads to the corrosive effects of ethanol. Contains Rubber & Plastic Conditioners: Dual lubricants condition rubber and plastic components, and rejuvenate and protect the rubber gaskets and seals that may have been dried out by ethanol. Fuel Stabilisation: Keeps fuel fresh and stable for up to 1yr, whist also promoting quick starting. Upper Cylinder Lubrication: After the lubricants are burned in the combustion chamber, a synthetic lubricant is left lubricating the entire upper combustion chamber including piston rings and valves. Reduces Emissions: Enables a clean and efficient burning of fuel. Note: This is not a replacement for 2-Stroke Oil! Lawn & Garden: Pour 8ml (2 capfuls) per 5 litres of fuel, (30ml per 20 litres), into the fuel tank or storage container. Automotive: Pour 30ml per 40 litres of fuel directly into the fuel tank. (Measures are approximate – a greater dosage than advised would not be detrimental). Quickly and effectively maintain gravel driveways. Enabling the comfortable and effective trimming of grass, weeds and brush for over 30 years. DR Power 2018 Catalogue with New Products Added.